For Superman, it means realizing that the government he so dearly upholds the values of is capable of secretly conducting weapons tests. For Wonder Woman it means siding with women villagers raped and imprisoned by male oppressors in Vietnam, then known as Indo-China. When Batman, always with his guard up, confronts a new alien hero whose weakness is fire, he warns, "I have a $70, 000 sliver of radioactive meteor to stop the one from Metropolis. With you, all I need is a penny for a book of matches." This is not your average episode of Super Friends . 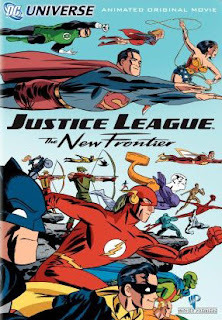 It is a nice capsulization of Darwyn Cooke's love letter to the Silver age of comics, DC: The New Frontier . A far more involved masterwork by the former animator, its cartoony style belies its serious examination of civil rights, anti-communism, and the turbulent late 50s-early 60s in which these concerns were distorting the notion of what the American Way really was. Much of the movie is shot with a definite eye to preserving Cooke's distinctive style. My only complaint, is that so much of the story is compressed into a 75 minute running time. By the story's end you may not be aware of what the film's villain represents without having read the original comic, or seen any of the DVD's featurettes for clarification. This movie would benefit from having a longer cut. Warner Premiere is obviously attempting to pursue quality in their new direct-to-DVD feature series (check out the featurette promoting their anime-inspired Batman: Gotham Knight in this DVD's special features). The voice actors include such actors as David Boreanaz, Keith David, Miguel Ferrer, Neil Patrick Harris, John Heard, Lucy Lawless, Kyle MacLachlan, Kyra Sedgwick and Jeremy Sisto. And director Dave Bullock has since been busy directing George Lucas' new CGI-animated series Star Wars: The Clone Wars , to air this fall on TNT and The Cartoon Network. Justice League: The New Frontier is a fine entry to list on any one of these professionals' resumes. This animated film demonstrates the full potential of what superhero stories can comment on in a way that no live-action release (with the possible exception of Unbreakable and The Incredible Hulk TV series) has as of yet. Check this DVD out to see what the superhero genre is truly capable of.